On June the 23rd the British people will be asked in way of a Referendum weather they wish to remain a member the European Union or Leave it. I myself have already voted by post, so for me the TV Debates and Political speeches on the issue are meaningless, unless it’s just for entertainment. In this article I’m going to set out why I voted to leave the EU. 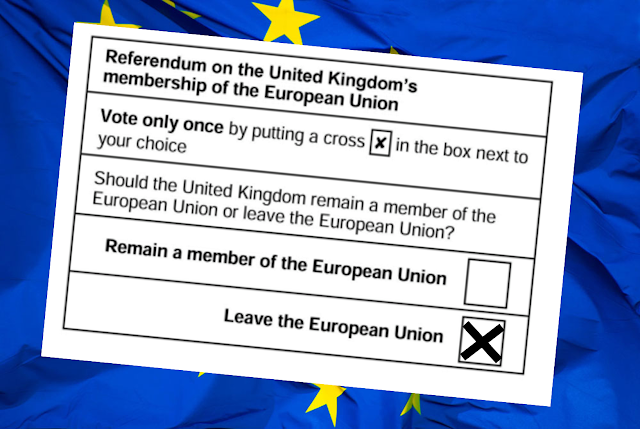 To me it was clear before the referendum was even called that the EU had not only become too controlling for its own good, but it had also become too bureaucratized and overcomplicated for its own good as well. My views on this matter were reinforced when I heard Harriet Harman on the Daily Politics say she didn’t know who the 7 presidents of the European Union were. Back in 1975 when the UK first joined the EU (when it was called the European Economic Community), it made sense. It made sense that at a time when tariffs were high and free trade was difficult to join with a collection of countries that had tariff free access but we now live in a global economy and taffies have never been lower. Also the EU is now much bigger than just a trading area, it now dictates in all areas of our lives weather that’s in our courts, our farming industry, our fishing industry or indeed striping us of our boarder controls. One of the biggest myths in the whole EU deal is “Free Trade” actually it’s not free trade because we pay ten billion pounds a year in order to access the single market, if I pay six pounds a mouth to Netflix I’m not watching films for free, I’m paying a subscription to that company and I’m accessing their service. Also one of the big reasons why I am voting to leave is because of TTIP. The Transatlantic Trade and Investment Partnership is a series of trade negotiations being carried out mostly in secret between the EU and US. As a bi-lateral trade agreement, TTIP is about reducing the regulatory barriers to trade for big business, things like food safety law, environmental legislation, banking regulations and the sovereign powers of individual nations. It is, as John Hilary, Executive Director of campaign group War on Want, said: “An assault on European and US societies by transnational corporations.” To me, just another reason to leave the EU. As the vote takes place tomorrow, we will soon see where the destiny of the UK is headed. You've entirely misunderstood the concept of "free trade" which means no tariffs, quotas etc are imposed upon exports and imports, meaning countries can use comparative advantage to specialise in the good and services they can produce at the lowest opporunity cost. The government pays the subscription which aids EU projects and is based on who is doing the best economically- akin to progressive styles of taxation. Whilst I agree with you about TTIP, envisaging a scenario where our Government would be any better is ludicrous. They'll push for an agenda much further right-wing, neoliberal and punishing to the ordinary person. They certainly won't follow agendas close to anyone at War on Want. Also, the "global context"- there's significant evidence of trends to suggest that 'regionalisation' rather than 'globalisation' is taking place in terms of Free Trade Agreements and so leaving the EU is more likely to leave us in a much harder position to negotiate globally. Unfortunately we can't reverse this decision and we'l have to live with the consequences. I see your point, but I think the reason why a lot of people have voted to leave was because they didn't see the EU as democratic I think.